Every branch of the American military provides opportunities for educational benefits and ways to attend college at either no cost or at a cost far below published tuition rates. No military member, veteran, or dependent should have to go through school without knowing what their benefits are or how to obtain them. Unfortunately, due to sales rights restrictions, we cannot offer Military Education Benefits For College for sale in your country. Every branch of the American military provides opportunities for educational benefits and ways to attend college at either no cost or at a cost far below published tuition rates. No military member, veteran, or dependent should have to go through school without knowing what their benefits are or how to obtain them. Military Education Benefits for College guides you in how to access, utilise, and take advantage of your benefits so you can earn the degree you deserve. As a retention non-commissioned officer in the Army National Guard, co-author David J. Renza witnessed firsthand how these education benefits were used as a bargaining tool to encourage people to enlist and/or remain in the military. He also discovered that the vast majority of military personnel, veterans, and their dependants are unaware of what is available to them, and where to find answers to their questions. They needed help. Co-author Lt. Col. Edmund J. Lizotte (Ret. ), Director of the Military Program at Post University (and former commander of a recruiting battalion), reached the same conclusion. Lizotte encountered a large population of eligible personnel, many of whom had put off using their education benefits during their military careers. Together, Renza and Lizotte have produced a comprehensive, readable, informative, and indispensable step-by-step guide into every facet of the education journey. 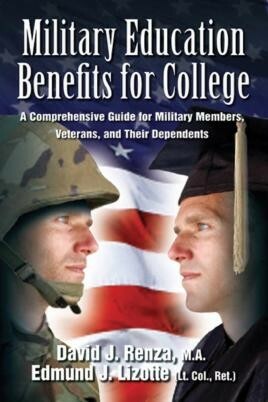 Their book also dispels myths about the college experience and offers insight from two former military members who have the unique perspective of military admissions counsellors and veteran students still using their education benefits to this day. David J. Renza is a U.S. Army veteran who served in the Connecticut Army National Guard for twelve years. Lt. Col. Edmund J. Lizotte is a U.S. Army veteran with 25 years of service.